As I mentioned in my last post, The 2013 Summer Camping Project - Lessons on Community, we've just finished 41 nights of camping over the past 4 months. During that time we learned a lot about which items we consider to be essential car camping comfort items, luxury items we want to buy for next season, and items that we'd never camp without. Christmas is coming so this is a good opportunity to start making those wish lists for next year's camping season too. Below are a few things we grew fond of this summer while camping - some new to us, and others that just remain awesome each year. I've also included my wish list items at the end of the post that we might try to pick up before the 2014 season. This die-hard tenting family finally caved and bought a small hybrid trailer this spring at the prospect of camping for 40 nights. The result? LOVE the trailer. Will never camp without it again. Tents are awesome in the backcountry. Car camping though - might as well make it as comfortable as possible, right? We stocked our trailer with everything from toys to dishes, pantry food and spices, toiletry items, and about 80% of the other items we had to pack up each and every time we went camping the previous summer. The end result was 1 hour of packing before each trip, gathering clothes, food, and a few last minute items. It was so sweet and easy. We're official RV converts now. While we still don't have a shower or toilet in our trailer, and while we have soft sided pull-outs, we are much more comfortable and I slept better in the trailer than I do at home now. I fell in love with stand up paddleboarding last August, 2012 when I tried it in the Okanagan. I bought my own board at the end of the last season but never got to use it on any camping trips until this year. Actually, I guess I never really got to use it on any camping trip because I bought a new board this summer to replace the second-hand one I had originally purchased. We planned most of our trips around places we could paddle this summer and bought a two-person recreational kayak so that my husband and son could join me out on the water. We had a blast becoming a paddling family and will definitely be choosing more water-friendly campgrounds next summer as well. One thing we learned though this summer was that when a campground is advertised as being across from the beach, near the beach, or even that it has a beach, this still does not mean you will be camped close enough to the water to just put your boats in anytime you want. We will be searching out waterfront camping sites next summer so that I can actually put my board in at sunrise or sunset without carrying it half a mile (or further as was often the case). Get a down blanket and you won't need to worry about ever being cold when camping! Yeah, we have a trailer, but it still gets really cold in a trailer when you're camping in May or September and we don't use our heater while we sleep. We used real sheets, blankets, and a down duvet on our bed but it was still a bit chilly for me at times. On those nights, I'd taco myself in my down blanket, get into bed, and within 5 minutes it felt like I was wrapped in an electric blanket. The KEY to ultimate warmth is that you have to put the down blanket next to your skin and layer the other blankets over top. Our son didn't like the cool fabric against his skin so his was layered over his first blanket and he was never as warm as I was. Sadly, MEC is no longer selling down blankets so this item is a bit more difficult to find. Thank God we had the foresight to buy a second one when they went on clearance this spring. REI sells a similar product though made by Therm-a-Rest. Best Christmas present last year!! In previous years when we've gone camping, I've had to bring sandals, biking shoes, water shoes, hiking boots, and a plethora of other footwear. This year, I camped in my Keen sandals and used them for everything! I even used them for backpacking this summer. They are that awesome! The only time I had to switch to other shoes was when they were drying out after using them in the water. The solution for next year will be to get one pair that I reserve for the water so that I always have a pair of dry ones. I even have them picked out so follow this link to see the Clearwater CNX sandals that I plan to get for next summer - in pink of course! If you haven't checked out the gear review I did for our new Eagles Nest Outfitters hammock, take a look and add a double nest hammock to your Christmas list. Best camping investment ever (aside from the trailer maybe). Our campsite was always popular thanks to the hammock and I'm sure we've had at least 6 kids in the hammock at one time. You can't get a trailer and not buy one of those giant carpets to place under your awning. It helped keep dirt out of the trailer and I enjoyed the civilized atmosphere it created. Between the awning, carpet, the outdoor kitchen, and our lawn chairs, we created a small outdoor room in front of our trailer. Our son would sit on the carpet to play with his toys and sometimes I sat there to play guitar as well when I needed quiet time. We got our Woods RV Matt from Camper's Village and I honestly don't know what size we got but they come in 9x18 and 9x12. Loved the bikes!! Especially loved Noah's new Spawn Cycles Banshee! Got very tired though of having to throw the bikes in the back of the truck or trying to fit them in the trailer. 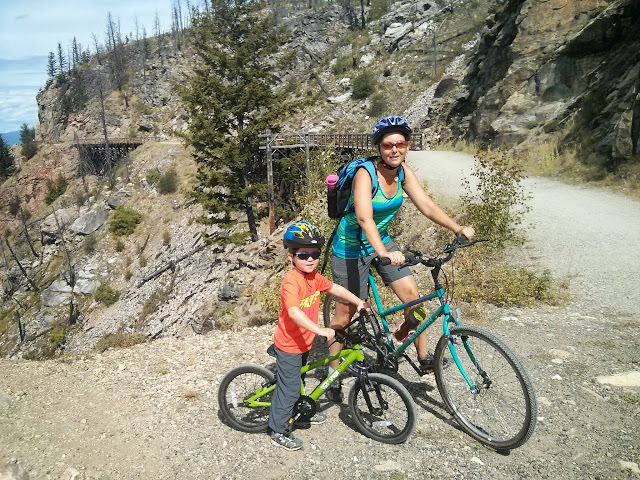 We ended up just bringing my son's bike and mine to save room. My husband got a lot of running in last summer! Need a bike hitch for the trailer! What's camping without a fire? Yet sadly we spent 13 nights camping last summer (in a row) under a fire ban. I read a LOT of books on that camping trip without the fire to provide a natural source of entertainment after our son had gone to bed. Next summer we definitely need to order one of those Amazing Campfire in a Can gadgets. What's camping without a fire? Families that like paddling spend a lot of time on the beach. Beaches are hot. Sun is hot. Shade is usually at a premium. Need a beach tent! I put this on the list with a bit of hesitation because I must make it clear that we are NOT that group blasting loud music at their campsite. Each morning though I'd find myself in the trailer making lunches for the day, and thinking, "it would be nice to have some light music playing in my trailer." 99% of the time I honestly can't see us playing music because I go camping to listen to the sounds of nature around me - but there are those times when a few minutes of music would just be nice. My friend Greta is the Bush Pie Master and always makes us delicious bed time treats over the campfire from apple pies to recess peanut butter cup pies. Sadly though I can't get her to come on every single camping trip we do and be my personal pie-maker. Think we'll have to buy our own pie makers eventually. Then we can try making pizza too! If you have no clue what I'm talking about, check out this link that explains what a bush pie maker or pie iron is. For more recipes check out this link to Bush Pies - The Perfect Camp Food. I also like this website: Mennonite Girls Can Cook. Tons of great bush pie recipes on it along with complete directions for making them. I know it's a sin to covet, but I covet my friend's camp couch or double lawn chair (whatever you want to call it.) It's the perfect chair in which to cuddle kids to sleep by the campfire or snuggle up with your partner after getting said kids to sleep. Anyway, I want one. And it's definitely going on my Christmas list. Nothing says luxury camping like drip coffee first thing in the morning. 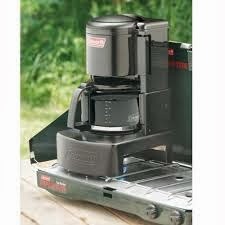 I thought it was just a dream until I found the Coleman Camping Coffee Maker. And, add to Christmas list. This is purely a luxury item and probably won't go on any Christmas list. BUT, I saw lots of trailers with patio lanterns strung from their awnings last summer when we were camped in the Okanagan. Loved it! Thought, wow, we should do that. Fortunately we did have some battery powered twilights from Eagles Nest Outfitters that we were able to use. Maybe we just need more of them. Any recommendations for brands we should buy for some of the items above? I'd love to hear what kind of propane fire you use, hear how you make camp coffee, or if you use lights to give your camping space some atmosphere. And would LOVE thoughts on the trailer bike hitch! Great review! We bought our trailer 3 years ago, and discovered a lot of these same items. They make a big difference! As much as we love the trailer, we find ourselves planning at least one back country paddle-in trip next year. Parlty because our daughter is now big enough to handle it, and partly because we find the need to escape some of the business of campgrounds full of... trailers. Funny how things go full circle. 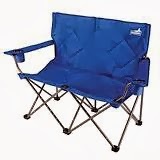 A big tip I have for you is to consider that you may go back to tent camping one day, so when you buy new things for your trailer consider if they'll work for a tent trip too. We find ourselves having to buy a lot of new gear (oh darn). But our trailer dishes and cooking stuff will work perfectly because we went light-weight and packable. PS - We actually have a small electric coffee maker in our trailer. Fresh coffee in the morning at the push of a button.... bliss! Thanks Gayle. We still have all of our tent gear so will not have to buy anything new when we do those trips. We continue to like walk-in tent campgrounds and we do at least one backcountry trip per year too. What kind of coffee maker do you use, or is it just a normal one that you use when you have power? We're starting to like campsites with power more and more these days. I don't have a trailer but I will second the idea of getting a bike rack. We just got one this summer for our Subaru and it made a world of difference! Getting bikes on it takes 30s! I don't know what options are available for trailers but I really like the platform racks where the bike sits and is strapped down vs the bars ones where it hangs. It seems much more secure and is easier to use bc you're not holding up a 30lb bike while also tying it in. Whatever rack you get, check in advance it works well for women's and kids bikes. Lots of them seem designed for men's road bikes and women's bikes don't fit at all on some. I'd recommend Racks Unlimited. Great selection, cheap install and ppl are knowledgeable! We wound up getting a Swagman rack there. I think we'll have to get a front hitch for the truck because it's hard to find a bike hitch to fit on the trailer itself. But yes, definitely need one! We have one for the truck that works when we don't take the trailer. It's the trailer that has thrown things off. We got our kayak rack from Racks Unlimited. Great place. Hi Tania. Glad to have met you through out playgroups. I've got you on my mental list of "people I want to get to know better." Have fun at Fullerton. We are trying to figure out where we want to go today. Let me know how Fullerton is post-flood. We have that same camp kitchen - love it! And we also feel the the screen tent is a must have - key for eating without as many bugs. Our "luxury item" for car camping (we do tents) is an inflatable double mattress - extra thick. We use the car to blow it up - makes longer trips that extra bit more comfortable. We love music (and weather reports...) so we do have a portable i-pod dock we drag around - http://www.etoncorp.com/en/productdisplay/soulra It is water and sand-resistant and has a solar panel for charging so if you haven't got a power source it's a great option. It's been great for us! We have one coffee drinker, one tea drinker, one cocoa and one cocoa or tea depending on mood. So we have a big kettle that serves everyone and for coffee we us a stainless steel french press style coffee maker - just dump in grounds and hot water! Thanks Kate. I love hearing what everybody else uses. We have a portable i-pod dock but unfortunately it doesn't fit my iphone. Will have to check yours out. And we had a French Press too. Used it up to the end of the season when it broke. Maybe it will go on the Christmas list. Tanya, looks like a great list of items you have and are looking forward to getting. I would suggest you consider the IncinerGrate from FIREase. It makes campfires the easiest, least maintenance. There is a collapseable version coming soon for car campers. For my birthday this year, I got the GSI Bugaboo Camper Cookset. And we love it. We tent and will do more backpacking next year. With a family a four, it is just perfect. It has pots, pans, strainer even built into the one lid, and then plates, cups and bowls, and it all nests into each other. It was a great addition to our camping arsenal. We also have the GSI Destination Kitchen (Mother's Day gift), although it's a bit bulkier compared to the cookset, but perfect to have lots of utensils, cutting board, cutlery etc. I love the down blanket idea... This just might need to be on our list too!! Is there a camping waffle maker or would you go electric? Intrigued by that idea. Welcome Back to our Old Friend Winter!